So, this has been an amazing summer of running, training to get ready for the fall running season. It's also been a great summer to get inspired by some of the best athletes in the world as they made their way from Eugene, Oregon to Rio de Janeiro. The gear that we run with is essential to our success. While I'm not an Olympic level athlete, I still want to perform at my best with getting injured. This is what brings me to Compression socks. They are great for increasing blood flow, they'll help you recover faster after a long run and they are good for preventing shin splits. Also, I don't know if this is proven or not... but in many cases they help stop Knee pain. Last year, I ran into a lot of trouble with muscle cramps during the latter stages of a race. In the Race 13.1 Charlotte it Started around mile 9. I had to walk most of the last three or four miles. In Savannah, it started at mile 11 but I was able to keep it moving until just before teh finish line. During the Thanksgiving Day turkey trot in North Raleigh, I made it to the last mile before I had to walk it out. I tried everything. I've changed my diet, increased water/fluid intake before a race. I've added more bananas to my diet. Two things seemed to work. Focusing on different muscle groups and compression socks. I have had compression socks that are too tight, too loose and some that were tight but did not stay in place. They would fall down to just under my calf. For the too tight category: Imagine trying to take socks off after running 13 miles. Then you try to catch your breath, dry off, drink your post run sports drink and change your clothes. As you're taking your wet socks off -- because it's summer time and you're like me and sweat like a pig in a slaughterhouse -- you trigger a cramp in your calf. That cramp was not from running.. but from trying to pry that super-tight sock off your leg. Let's just say that happened too often and was painful! Ending your run with a cramp is not how you want to begin your recovery and prepare for your next run or race. The first pair of compression socks that I bought were from Target. I thought they were the best... and maybe they were good for about three four-- tops - five runs/races. After that they were just socks. They weren't really tight anywhere and and real use for them had faded away in the washing machine. Too loose. Another air of socks, I bought online because I thought they were cool. the 13.1 socks. They were tight, and they were pretty good but the fit wasn't quite right. I always follow directions on how to fit these things right. Whenever I put those socks on, I can almost bet that they'll be under my calf muscles in less than 3 miles. These socks made by Legend Compression Wear are just right. When I have these in I run with confidence. Legend in a local Nirth Carolina based company that has its roots in medical compression socks. So, you know there is real research behind their products. So, when do I wear my socks? I'll usually save them for longer runs ( anything more that 7 miles.) If I have had a tough training week or just before a race I'll wear them around the house or to the store under my clothes. The goal there is to promote muscle recovery. I'll wear them before a race especially if I have a two race weekend! And finally I like to wear them during long drives to and from races. I'll usually have a pair of socks to run in and a post-race sock to recover in. It sounds like I wear them all the time, but I don't. I don't want to depend on them too much. 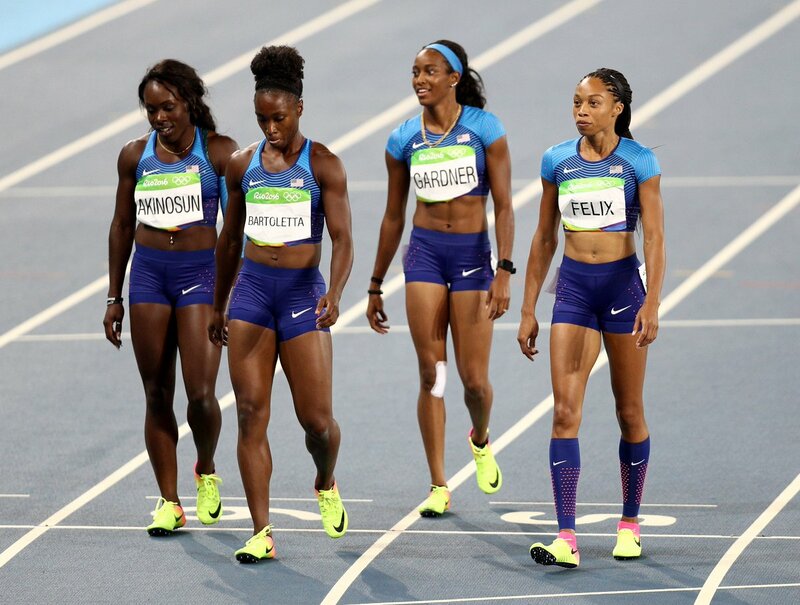 I noticed that here were only a few Olympians this summer sporting compression socks or sleeves - most notably Allyson Felix. Check these socks out. You can also get a discount by using code AmbFriend2016 for 15% off!